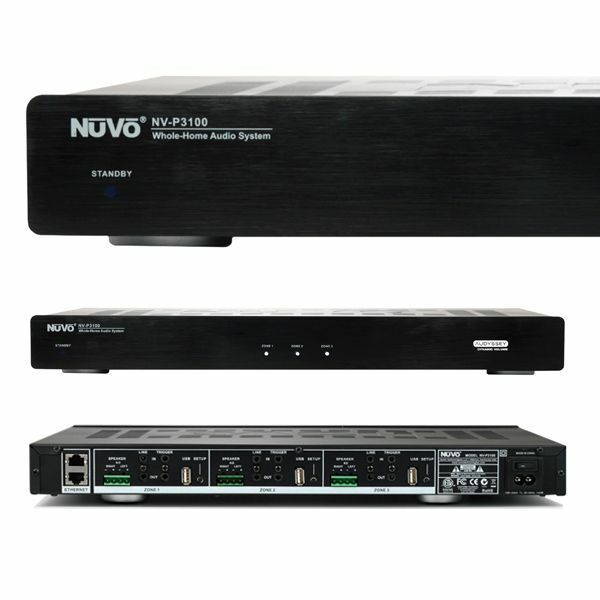 The NuVo NV-P300 Player Preamplifier is a versatile addition to the Player Portfolio, ideal for introducing incredible source flexibility and superior audio to maximize an external power amplifier’s capabilities. This links zone players together wirelessly or over a conventional home data network, to play all of your digital music in superb quality. The system is based around a small number of Amplifier Players ranging from the diminutive P100 (right) with an output of 2 x 20W, to the P200 (below) with an output of 2 x 60W for larger rooms. The NuVo P200 also includes a built-in Bluetooth radio so that you are able to stream music to it from smartphones and PCs etc. Nuvo have their own App to drive the system which is also available for Android devices, and continuously developing the system to add new features and services, which can be simply upgraded onto the system via an on-line download. You can see a demonstration of the NuVo Controller App here. Each zone can be independently controlled, or simply linked together so your music can follow you around your home. For cost effective custom installs where multiple zones need to be installed together there is the P3100 (right), which is effectively like 3 x P100 units in a single enclosure for convenience. With a back-lit touch screen for configuration, system status, and the ability to show zone names, the P4300 Professional Series Player is the latest generation of Nuvo Players. Providing 110 Watts of power per zone, this single rack-mount unit delivers high fidelity audio to three independent zones. Your music is always in hand with built-in access to streaming services and the ability to play content from networked computers and your iOS and Android devices.